Daily Illuminator: Zombie Dice Returns! 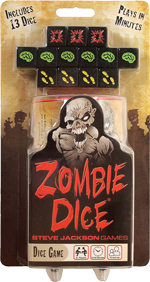 November 16, 2012: Zombie Dice Returns! Well, at least for a little while. Zombie Dice continues to blow off store shelves, and the most recent shipment of 20,000 games came and went in a single day! We're not expecting to receive any more copies of Zombie Dice until the spring, so if you're wanting to grab a copy for you or your friends I suggest searching stores ASAP. We're doing what we can to stay ahead of demand, but it seems like no matter how many we run there's always more demand for the game than we expected! This is a very good problem to have. Thank you, zombies, for being so very hungry for brrraaaiiiinnnnssssss!!!! !